What happens when some of the best musicians in Europe come together... to play football? Players from the LSO, Gewandhaus Leipzig and Guildhall School of Music & Drama came together with the Philharmonia to play some serious football - and we've got all the photos. 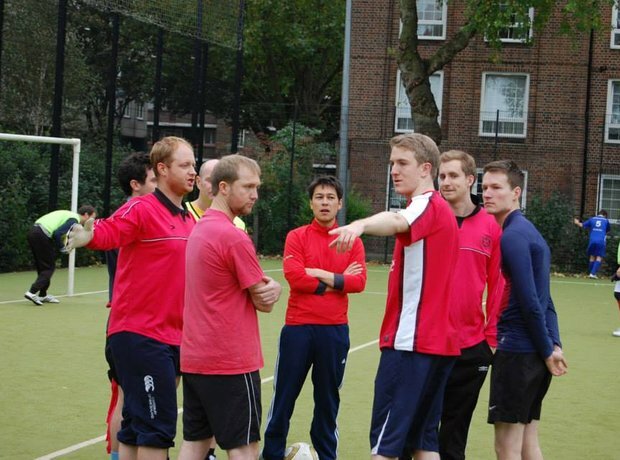 The Philharmonia Orchestra have a pow wow to discuss tactics ahead of the big match. Meet the team from the Philharmonia Orchestra! Great coordination from Gewandhaus Leipzig FC. No aggressive tackles please - don't want you damaging yourselves ahead of concert season! Resplendent in yellow vests, the London Symphony Orchestra prepare for their match against Philharmonia FC. Players from the Guildhall School of Music and Drama. Where's your football strip, chaps? Come on you blues! Gewandhaus FC give the Philharmonia a run for their money. The all-important cheerleaders are out in force to support their fellow orchestral musicians. Philharmonia double bassist Gareth Sheppard celebrates after scoring an impressive goal.